Are you suffering from Folliculitis? Folliculitis is a highly discomforting condition that can be very irritating for sufferers. Read on to know how to get rid of folliculitis if you are affected by the disease or have someone suffering from it in your family. 2 How To Treat Folliculitis? 5 How To Cure Folliculitis By Shaving? Folliculitis is a condition that causes inflammation of the hair follicles in the skin. It may result from an ingrown hair, bacterial infection, fungal infection, viral infection, yeast infection or parasitic infection. The disease leads to the development of rashes, papules, swollen bumps and pus-filled boils on the skin surface. In most cases, Folliculitis goes away naturally and does not require any treatment. Superficial Folliculitis does not cause any permanent damage to the skin. Treatment generally becomes more necessary for Deep Folliculitis. The treatments for Folliculitis can include anything from antibiotics and mouthwashes to drugs and Laser Hair Removal. Know about some of the main methods used for Folliculitis Cure. In case of a bacterial Folliculitis, the topical application of an antifungal or antibacterial ointment or cream can kill the fungi or bacteria present at the swollen region. In people with Folliculitis antibiotics can be quite useful as a remedy. Severe cases of Folliculitis may need the use of oral antibiotics. Antibiotic medicines are taken through the mouth. The drugs enter the bloodstream and dissolve thus curing the condition from within the body. Oral antibiotics like Cephalosporins and Dicloxacillin are said to be very effective as Folliculitis remedy. Folliculitis of moderate strength can also be cured with antibiotic creams of prescription strength. Irritation and swelling in the Folliculitis affected parts of the skin can be treated with oral or topical corticosteroid medicines. Patients should use these medicines as per the guidance of their doctors. For itchy Folliculitis treatment over the counter medications can include anti-itching, anti-bacterial, anti-fungal and analgesic creams and drugs. Antibiotic ointments containing Mycitracin, Bactrobam or Bacitracin are quite effective in curing mild Folliculitis cases. Rinse the mouth with antibacterial washes containing povidone-iodine. This will kill the bacteria and prevent the spread of the infection. Know about some of the popular methods used as cure for Folliculitis at home. Apply 1 ¼ tsp of vinegar to a small glass of water. Soak a cotton pad with a little of this solution and press over the bump for 5-10 minutes. It will help reduce pain and itching in the region. Mild cases of Folliculitis can be cured by applying soap water over the pimples. This treats slight infection in a few days and causes the pimple to fade away in a short time. Daily washing the infected area with antibacterial soap after exposure can help clean the region and prevent further complications from infection. In mild cases, it may even succeed eliminating the bacteria and cure the disease. If you have a very dry skin, using a lotion free from fragrance can help moisten the skin and prevent recurrence of the condition. 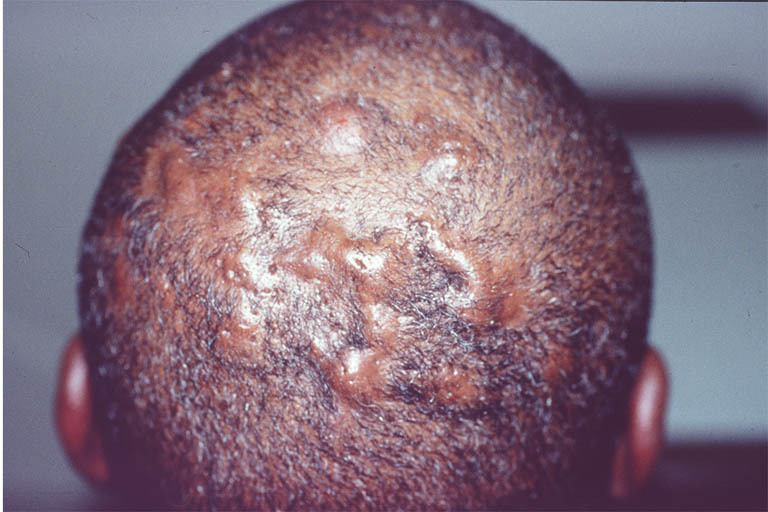 In case of a Folliculitis on scalp, a doctor may prescribe a shampoo. Shampoos for Folliculitis treatment contain a toxic non-metallic element called Selenium. It is said to be very effective in treating Folliculitis in the scalp and beard hair. In Scalp Folliculitis shampoos work as an effective remedy. These are useful for Staphylococcal folliculitis treatment. How To Cure Folliculitis By Shaving? Folliculitis resulting from shaving can be cured by changing the technique. Gently massage the region to be shaved with soap, water or shaving cream. This is particularly applicable for people with sensitive skin. It softens the skin and reduces the harshness of the friction of the blade with the skin. Using a new razor blade before shaving each time can also prevent hair follicle injury or infectious cases. In very serious cases of Folliculitis, laser treatment is used. This prevents the infection from spreading inside the body. Laser treatment successfully kills the affected hair follicle and destroys the bacteria from the root. Use of laser for cure avoids chances of scarring at the site of inflammation. However, it leads to permanent hair loss in the treated area. Laser destroys the hair follicle forever and leaves no chance for re-growth of hair in the region. Hot Tub Folliculitis refers to a bacterial infection resulting from bathing in hot wooden tubs. In such cases, the affected person develops itchy red bumps over the skin within 24 hours after exposure. The bumps slowly develop into boils containing pus. The boils may erupt at a later stage to release yellow or green colored pus. Tea tree oil helps in combating infection. Directly applying this on skin infections like Folliculitis can reduce the symptoms and cure the condition. Mix a small amount of Thyme oil with water. Apply this over the affected skin region to reduce the symptoms. Consume three garlic cloves every day after you note the symptoms. This may help in alleviating the Folliculitis symptoms. If the symptoms last for more than 3 days despite home remedies and over the counter medications, you should get expert medical assistance. Calling a doctor is also highly advisable if you are having an infection in the affected area and suspect it to be spreading. A delay in treatment can lead to very discomforting symptoms and even cause long-term complications such as hair loss or scarring. Early treatment will help you avoid all these and make a faster recovery.